• “impressed with your Postie Mate. It’s so much quicker. 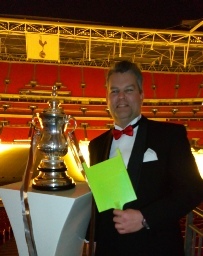 Managed 4 houses a minute on my estate.” Richard, Chesham, Bucks..
As a result, Postie Mate was in the National Final, in Wembley Stadium in December - hence this photo of David and Postie Mate with the FA cup. No wonder 100’s of Postie Mates have been sold throughout the UK! Please click on the logo and photo to see them full size.